SOLD OUT! Custom prototype features a life-size bust of Boris Karloff as Frankenstein's monster. Aged base includes functioning switches controlling back-lit eyes, arcing plasma globe, and back-lit faux voltage meter. This design is no longer being produced and was made to order. Never sold at retail. 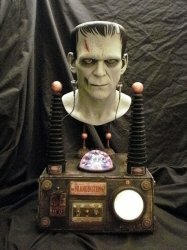 Designed and hand-crafted especially for MyMovieMonsters.com, this custom life-size prototype features a bust of Boris Karloff as Frankenstein's monster. Aged base includes functioning switches controlling back-lit eyes, arcing plasma globe, and back-lit faux voltage meter. The bolts on the Monster's neck can be "wired" to the base using two alligator-clipped wires to add to the effect. Bust is an accurate, hand-painted likeness of Boris Karloff as the Monster. It is approx. 1/4 inches thick. Lifelike prosthetic eyes glow when the "Optical Filter" switch is thrown. Purple and green plasma globe arcs with glowing "lightning charges" when the "Plasma Generator" switch is thrown. Charges are attracted to and react to the glass globe being touched. The globe casts an eerie glow on the Monster's face. The "Voltage Meter" lights up when its own power switch is thrown. Realistic "knife" switch completes the control panel. No two of these are alike, this piece is hand-constructed, with aging of base, wiring, bolts, and conductor towers make this high-quality piece truly unique. You will not find this hand-built prototype in any store. Piece is two feet tall from bottom of base to top of the Monster's head. Base is 14 inches deep and 15 1/2 inches wide including aged metal carrying handles. This will be the crown jewel of any classic horror, Universal Monsters, or Frankenstein collection! We also offer other high-end pieces for serious monster collectors. Important Shipping Note: We will only ship this item to a U.S. address. This piece is one of a kind and very fragile. Shipping insurance must be paid by the buyer. However, a replacement is not possible if a loss or damage is incurred; in such a case, an insurance claim would be submitted and a refund, if approved by the provider, would follow. If 2-3 day Priority Mail service in the U.S. is desired, please contact us before completing your order so that we can send you a separate shipping quote to reflect the dimensional weight pricing surcharge required by the USPS.